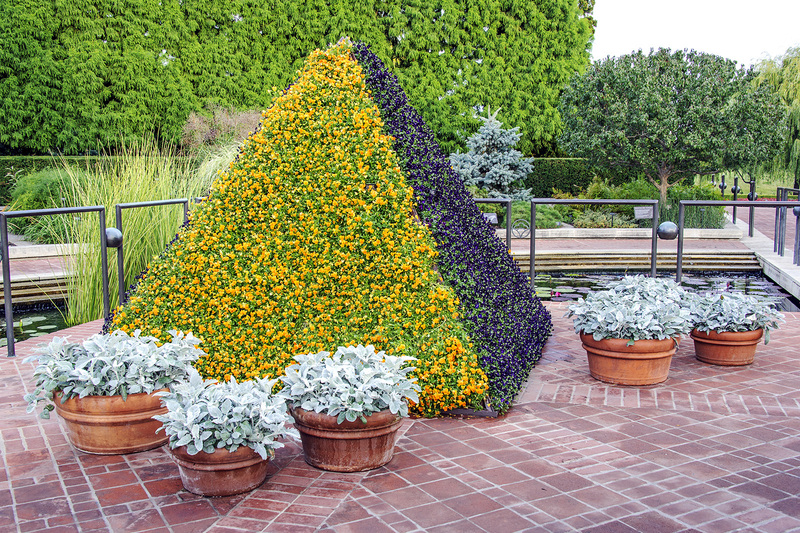 The Viola pyramids are currently on display in the Heritage Garden. 1. 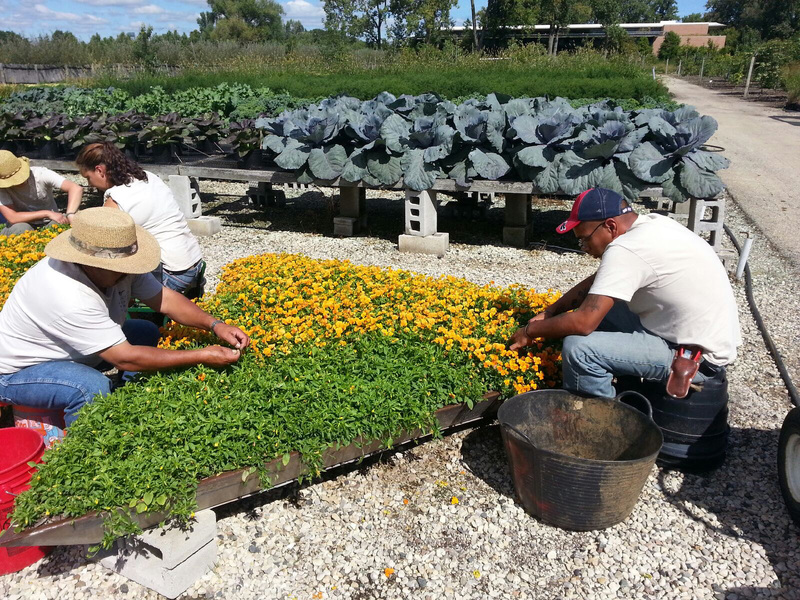 Our production team grew 6,400 Viola plants, half orange and half purple, so they were ready for planting into the pyramid structure by early August. The pyramids are 9 feet wide at the base, and 10 feet tall at the apex. 2. 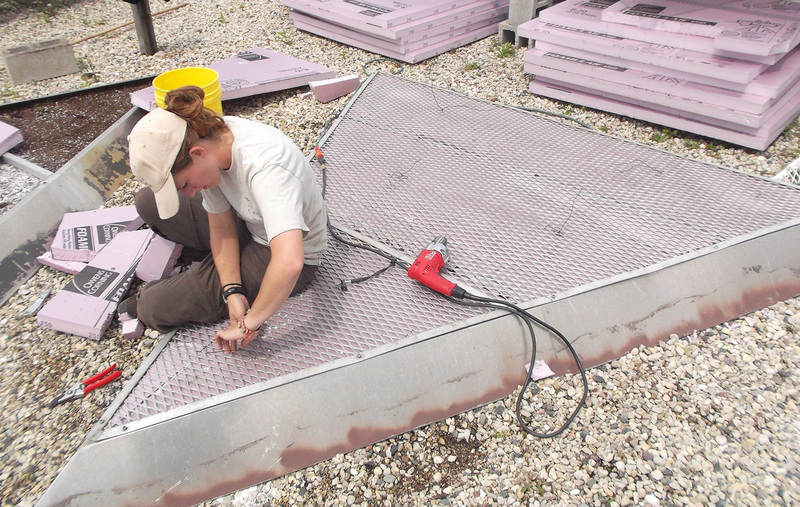 In the meantime, Melanie and I led the team to prepare the pyramid frames. Working in the nursery, our first step was to attach landscape fabric to the front face of the pyramids using hundreds of zip ties. 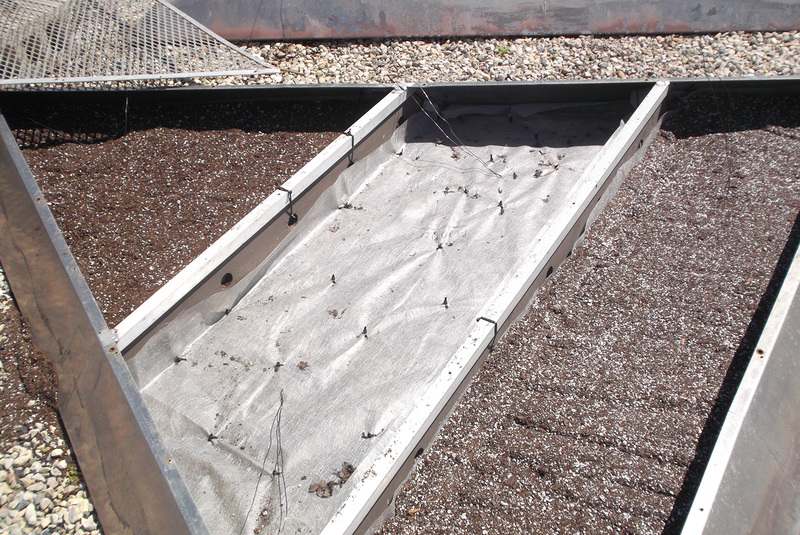 Landscape fabric helps hold the soil and the plants in the frame. We had to be very careful that the fabric covered every nook and cranny of the frame. 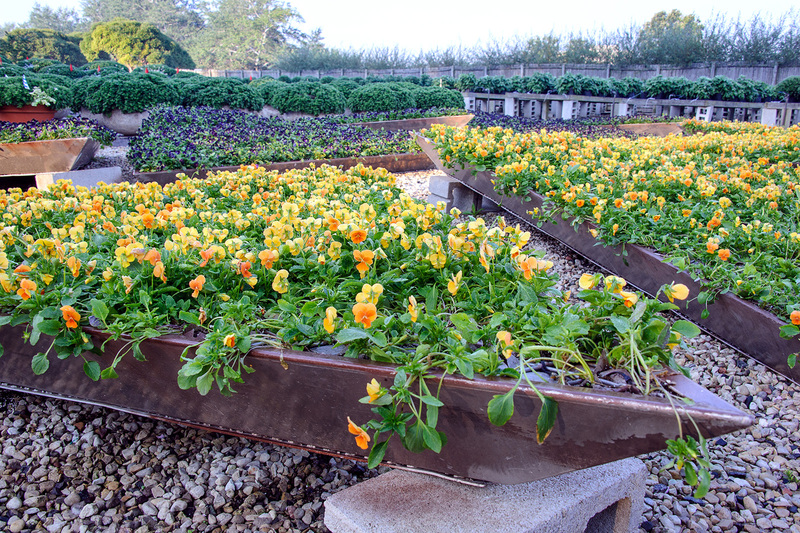 If not, soil would leak from the frame, and it would undermine the integrity of the entire planting space. 3. 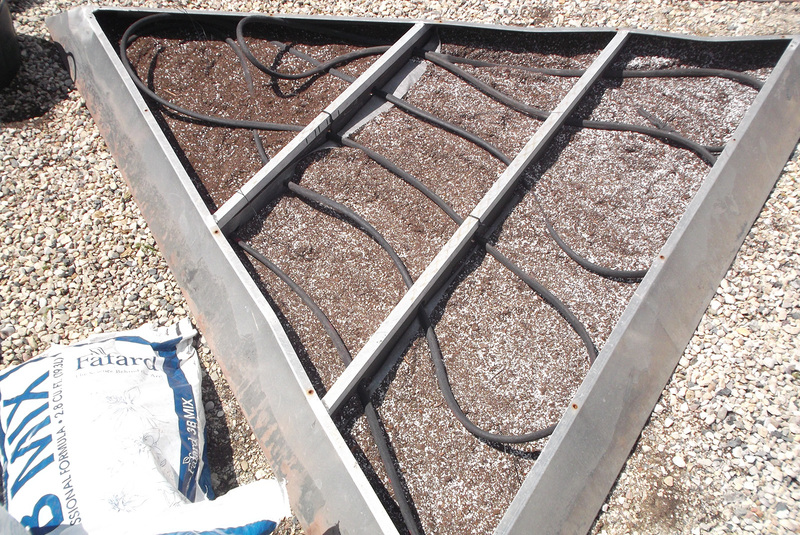 Next we custom-blended special planting media, using lightweight potting soil and perlite. The pyramids retain water differently at their tops versus their bottoms, so we changed the composition of the media throughout the frame to accommodate this variance. Near the top of the pyramid we used a heavier, more water-retentive blend of about 70 percent soil and 30 percent perlite. 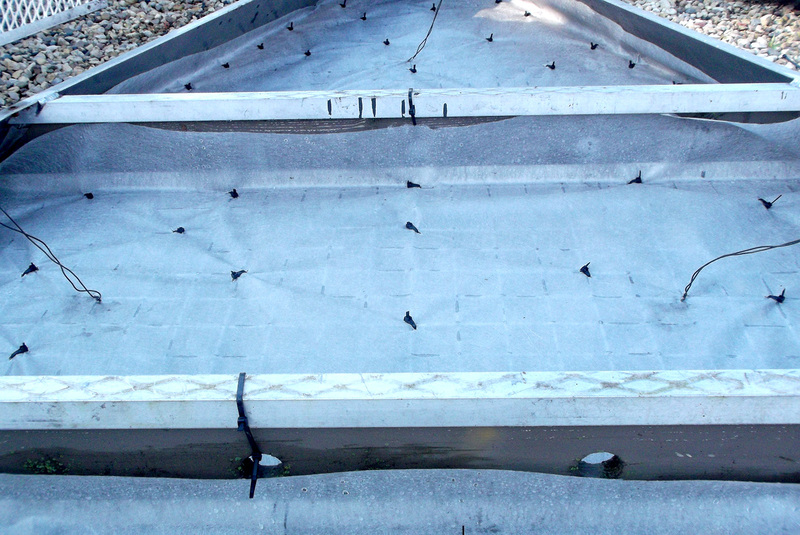 At the bottom, where there is a risk that the pyramid could become waterlogged, we created a lightweight mix that was about 30 percent soil and 70 percent perlite. You can see in the picture how the soil/perlite composition changes from top to bottom. 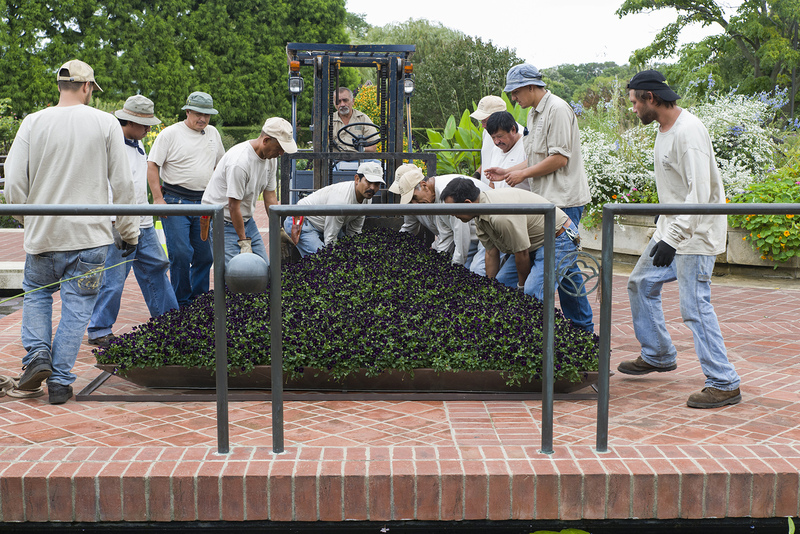 I just want to Thank each and every person who has a hand in making the gardens what they are. I so enjoy the time i spend here. I come once or twice a week. It is Never the same place. One has to just open their eyes to all the beauty around them . I always take a moment and stop and thank each gardener that i see. Some are even surprised. So once again THANK YOU ALL. I always enjoy knowing what goes on behind the scenes, and can only imagine the amount of planning that goes on to keep all the displays so beautiful and inspiring. More “how we did it” posts please! Also I saw the pyramids last weekend and they are just amazing. I am now trying to imagine deadheading them…..TWICE! We enjoyed reading about the development and construction of the Viola Pyramid. We were amazed at the time, talent, people and number of flowers involved. The end result is beautiful! Lew, thanks for your kind words. It is a labor of love, and I’m pleased that you are able to enjoy it — even if only through our blog. If you are ever in the Chicago area, please do visit. There is so much to see at the Garden.